Oggi però vorremo parlarvi di un’esperienza che a nostro avviso è stata indimenticabile per noi e che ci sentiamo di raccomandare a tutti coloro che si trovino a Bangkok in vacanza o anche semplicemente in scalo per un paio di giorni: fare un aperitivo/cena in uno Skybar, per poter apprezzare la bellezza e l’imponenza di questa metropoli asiatica dall’alto e a 360 gradi. La cosa potrebbe non sembrare così “originale” a primo impatto…di ristoranti e bar agli ultimi piani di grattacieli ne è pieno il mondo, e non solo in Asia, ma anche in America, Australia, Europa…ma allora come mai gli skybar di Bangkok ci sono rimasti così impressi? Beh, per un motivo fondamentale: essi non sono circondati da vetrate a tutta altezza, ma sono bensì completamente all’esterno, esposti all’aria e al vento! 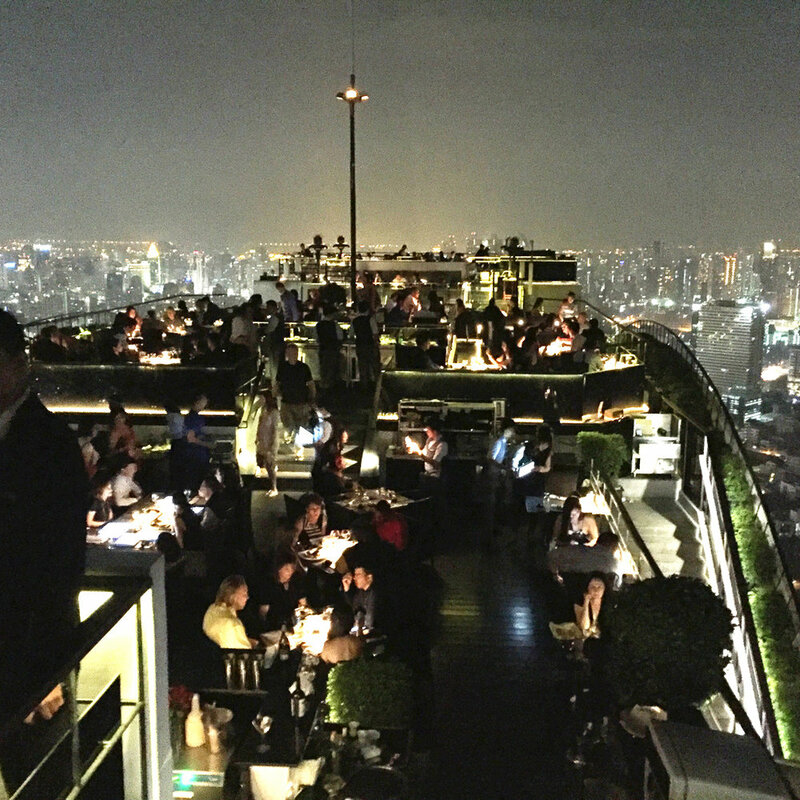 Noi siamo stati al “Vertigo and Moon Bar” in cima al Banyan Tree Hotel (che c’era stato raccomandato da alcuni amici australiani che avevano vissuto per molto tempo a Bangkok), anche se nella città ve ne sono molti altri, tra cui il Sirocco, il Three Sixty Lounge, lo Sky View 360, ecc..
Dopo aver attraversato a piedi una parte della città piuttosto trafficata, siamo finalmente giunti al grattacielo ed abbiamo preso l’ascensore per raggiungere il piano più in alto, dove si trovava lo skybar. Una volta usciti lo spettacolo che si è presentato davanti ai nostri occhi era decisamente mozzafiato! Pur essendoci dei parapetti, essi erano perlopiù in vetro e comunque avevano un’altezza non troppo maggiore di quelli che ci si potrebbe immaginare per una comune palazzina residenziale…la differenza è che lì ci trovavamo al 61º piano di un grattacielo e la cosa faceva un certo effetto! (Se si soffre di vertigini è bene considerare questo fattore…). Una volta giunti lassù abbiamo passeggiato per il ristorante e ci siamo diretti alla zona degli aperitivi, un’area circolare, rigorosamente scoperta, con un bancone al centro e dei tavolini attorno. Abbiamo preso un cocktail e ci siamo abbandonati all’emozione di quel panorama incredibile, dove l’occhio spaziava tra grattacieli e templi, parchi e mercati, il fiume Chao Phraya e la campagna in lontananza… in un’immagine d’insieme caotica ma al tempo stesso armonica che riassume perfettamente lo spirito di questa città e ne rispecchia la sua unicità. Lo spettacolo che questi skybar offrono è indubbiamente meraviglioso a tutte le ore del giorno e della notte, ma il fatto di essere arrivati lì per l’ora del tramonto ha reso l’esperienza secondo noi ancora più suggestiva. Vedere il cielo tingersi di rosso per poi lasciare spazio al calare della notte e delle stelle è stato infatti uno spettacolo mozzafiato! Today, however, we would like to talk to you about an experience that in our view has been unforgettable and that we would want to recommend to all those who are in Bangkok for holiday or even just passing through for a couple of days: have an aperitivo or dinner in a Skybar, in order to appreciate the beauty and grandeur of this Asian metropolis from above and in 360 degrees. This may not seem that "original" at first sight ... world is filled with restaurants and bars at the top of the skyscrapers, and not only in Asia, but also in America, Australia, Europe... so why were we so blown away by the Skybar of Bangkok? Well, for a fundamental reason: it is not surrounded by full-height windows, but it is completely outdoors, exposed to the air and the wind! 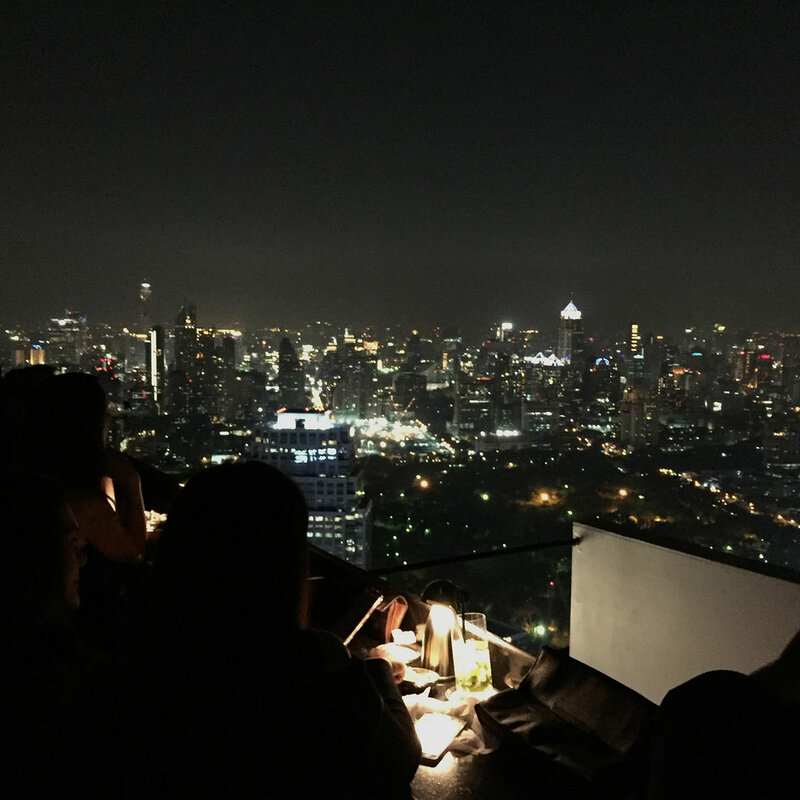 We visited the "Vertigo and Moon Bar" on top of the Banyan Tree Hotel (recommended by some Australian friends who had lived in Bangkok for a long time), although there are many others in the city, including Sirocco, the Three Sixty Lounge, Sky View 360, etc. After walking through a rather busy part of town, we finally got to the skyscraper and took the lift to the top floor where the skybar was located. Immediately the view that opened up before our eyes was really breathtaking! Although there were handrails, they were mostly in glass and in any case they seemed a lot lower than those of a common residential building! ... the difference is that we were there on the 61st floor of a skyscraper and it was a frightening effect! (If you suffer from vertigo it is good to consider this factor ...). Once we got there we walked over to the restaurant and headed to the aperitif area, a circular area, completely outside, with a central bar and tables around it. 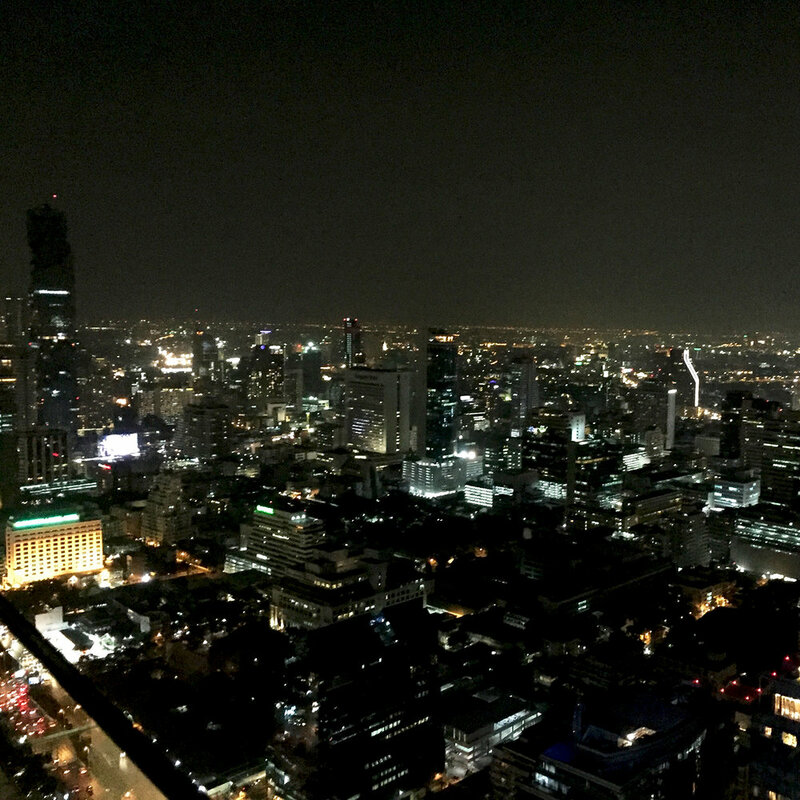 We took a cocktail and took in the thrill of that incredible view, where the eye was drawn towards skyscrapers and temples, parks and markets, the Chao Phraya River and the far-off country... in a chaotic but simultaneously harmonic way that perfectly sums up the spirit of this city and reflects its uniqueness. The show that these skybars offer is undoubtedly wonderful at all times of day and night but the fact that we arrived there by sunset made our experience even more impressive. Seeing the sky shine red and then leave space for the fall of night and the stars was in fact a breathtaking spectacle!